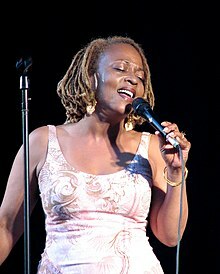 Cassandra Wilson is the third and youngest child of Herman Fowlkes, Jr., a guitarist, bassist, and music teacher; and Mary McDaniel, an elementary school teacher who earned her PhD in education. Her ancestry includes Fon, Yoruba, Irish and Welsh. Between her mother’s love for Motown and her father’s dedication to jazz, Wilson’s parents sparked her early interest in music. Wilson’s earliest formal musical education consisted of classical lessons; she studied piano from the age of six to thirteen and played clarinet in the middle school concert and marching bands. When she was tired of this training, she asked her father to teach her the guitar. Instead, he gave her a lesson in self-reliance, suggesting she study Mel Bay method books. Wilson explored guitar on her own, developing what she has described as an "intuitive" approach. During this time she began writing her own songs, adopting a folk style. She also appeared in the musical theater productions, including The Wizard of Oz as Dorothy, crossing racial lines in a recently desegregated school system. Wilson attended Millsaps College and Jackson State University. She graduated with a degree in mass communications. Outside of the classroom, she spent her nights working with R&B, funk, and pop cover bands, also singing in local coffeehouses. The Black Arts Music Society, founded by John Reese and Alvin Fielder, provided her with her first opportunities to perform bebop. In 2007, Wilson received her Ph.D in Arts from Millsaps College. In 1981, she moved to New Orleans for a position as assistant public affairs director for the local television station, WDSU. She did not stay long. Working with mentors who included elder statesmen Earl Turbinton, Alvin Batiste, and Ellis Marsalis, Wilson found encouragement to seriously pursue jazz performance and moved to New York City the following year. The M-Base group in Brooklyn, working with both jazz and pop forms, makes music that at first sounds like funk from the 1970s. Like the music played by Mr. Marsalis (and his brother Wynton) the music made by M-Base - Steve Coleman, with Greg Osby, Cassandra Wilson and Geri Allen – is, at its best, filled with subtle ideas working behind the mask of popular music. In Mr. Coleman's group a singer is supported by an electric bass, guitar, drums and electric keyboards, a shiny musical mix that has familiar rock and funk references; yet, because of all its rhythmic and metric manipulations, sounds new. Although the voice – typically treated as the focal point of any arrangement in which it is included – was not an obvious choice for M-Base's complex textures or harmonically elaborated melodies, Wilson wove herself into the fabric of these settings with wordless improv and lyrics. She can be heard on Coleman's debut as a leader Motherland Pulse (1985), then as member of his Five Elements on On the Edge of Tomorrow (1986), World Expansion (1986), Sine Die (1987), and on M-Base Collective's sole recording as a large ensemble Anatomy of a Groove (1992). At the same time, Wilson toured with avant-garde trio New Air featuring alto saxophonist Henry Threadgill and recorded Air Show No. 1 (1987) in Italy. A decade her senior and an AACM member, Threadgill has been lauded as a composer for his ability to transcend stylistic boundaries, a trait he and Wilson share. Like fellow M-Base artists, Wilson signed to the Munich-based, independent label JMT. She released her first recording as a leader Point of View in 1986. Like the majority of her JMT albums that followed, originals by Wilson in keeping with M-Base dominated these sessions; she would also record material by and co-written with Coleman, Jean-Paul Bourelly, and James Weidman as well as a few standards. Her throaty contralto gradually emerges over the course of these recordings, making its way to the foreground. She developed a remarkable ability to stretch and bend pitches, elongate syllables, manipulate tone and timbre from dusky to hollow. While these recordings established her as a serious musician, Wilson received her first broad critical acclaim for the album of standards recorded in the middle of this period, Blue Skies (1988). Her signing with Blue Note Records in 1993 marked a crucial turning point in her career and major breakthrough to audiences beyond jazz with albums selling in the hundreds of thousands of copies. Beginning with Blue Light 'Til Dawn (1993) her repertoire moved towards a broad synthesis of blues, pop, jazz, world music, and country. Although she continued to perform originals and standards, she adopted songs as diverse as Robert Johnson's "Come On in My Kitchen", Joni Mitchell's "Black Crow", The Monkees' "Last Train to Clarksville", and Hank Williams' "I'm So Lonesome I Could Cry". Wilson's 1996 album New Moon Daughter won the Grammy for Best Jazz Vocal Performance. In 1997, she recorded and toured as a featured vocalist with Wynton Marsalis' Pulitzer Prize winning composition, Blood on the Fields. Miles Davis was one of Wilson's greatest influences. In 1989, Wilson performed as the opening act for Davis at the JVC Jazz Festival in Chicago. In 1999 she produced Traveling Miles as a tribute to Davis. The album developed from a series of jazz concerts that she performed at Lincoln Center in November 1997 in Davis' honor, and includes three selections based on Davis' own compositions, from which Wilson adapted the original themes. Wilson was married to Anthony Wilson from 1981 to 1983. She has a son, Jeris, born in the late 1980s. Her song "Out Loud (Jeris' Blues)" on the album She Who Weeps is dedicated to him. For many years she and her son lived in New York City's Sugar Hill, in an apartment that once belonged to Count Basie, Lena Horne and the boxer Joe Louis. In 2000, Wilson married actor Isaach de Bankolé, who directed her in the concert film Traveling Miles: Cassandra Wilson (2000). Wilson and her mother are members of Alpha Kappa Alpha sorority. No Prima Donna, The Songs of Van Morrison (1994, Polydor): "Crazy Love"
Bob Belden: When Doves Cry: The Music of Prince (1994, Metro Blue): "When Doves Cry"
Spirit of '73: Rock for Choice (1995, 550 Music/Epic): "Killing Me Softly with His Song"
Jazz to the World (Christmas) (1995, Blue Note): "The Little Drummer Boy"
Bob Belden Presents Strawberry Fields (1996, Blue Note): "Come Together", "Strawberry Fields Forever"
Bob Belden's Shades of Blue (1996, Blue Note): "Joshua Fit de Battle ob Jericho"
Lounge-A-Palooza (1997, Hollywood): "The Good Life"
A Tribute to Joni Mitchell (2007, Nonesuch): "For the Roses"
1994 Jimmy Hollywood: "Let the Good Times Roll"
1994 Junior: "I've Got You Under My Skin" and "Little Warm Death"
1995 Miami Rhapsody: "How Long Has This Been Going On?" 1997 Midnight in the Garden of Good and Evil (film): "Days of Wine and Roses"
1997 The Last Time I Committed Suicide: "Country Girl" Javon Jackson with Cassandra Wilson vocals. 1998 B. Monkey: "Tupelo Honey"
1999 Passions (TV series): "Time After Time"
1999 Searching for Jimi Hendrix (TV documentary): "Angel"
2001 The Score: "Green Dolphin Street" and "You're About to Give In"
2002 Brown Sugar: "Time After Time"
2005 Don't Come Knocking: "Lost"
2008 My Blueberry Nights: "Harvest Moon"
2012 Good Deeds: "Time After Time"
2019 True Detective (season 3): "Death Letter"
Cassandra Wilson features as a singer in the following films. ^ "Cassandra Wilson on Allmusic.com". Retrieved November 23, 2009. ^ Giddins, Gary. (2000). Visions of Jazz: The First Century. Oxford University Press, ISBN 978-0-19-513241-0, p. 643. ^ Watrous, Peter (December 31, 1989). "POP VIEW: Private Codes Enliven Jazz". The New York Times. ^ Jones, Charisse (September 29, 1994). "IN THE STUDIO WITH: Cassandra Wilson; Singing a Song of the South". The New York Times. ^ Lewis, John (November 22, 2010). "The Big Interview Cassandra Wilson". The Metro. ^ "Cassandra Wilson". Mississippi Blues Trail. Retrieved September 15, 2016. ^ "Cassandra Wilson Signs to eOne Music". JazzTimes. March 26, 2012. Retrieved May 23, 2012. ^ Tamarkin, Jeff. "Legacy Recordings Signs Cassandra Wilson". jazztimes.com. Jazz Times. Retrieved December 14, 2014. Wikimedia Commons has media related to Cassandra Wilson.